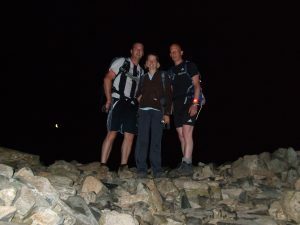 Our Night Hikes are a fantastic way to experience the magic of walking in the mountains at night. There’s something very special about wild places in the dark, the sense of peace is incomparable – a fantastic way to get away from the pace of modern life! Many regular hillwalkers have never experienced British mountains at night – they’re really missing out! We try to time the walk so that you experience the sun rising as you descend the mountain. This event is a great charity fundraiser, corporate experience or just a really good way to spend a weekend with a group of friends. You can even join in as an individual. Don’t worry, it’s as safe as walking in the daylight – our Mountain Leaders have been doing it for years on the Three Peaks Challenge. They’ll take good care of you! As we start up the rocky Pony Path the climb begins as we cross footbridges and rocky sections to reach the Red Burn, after which the path climbs in a series of long winding zig-zags before reaching the summit plateau. On the plateau the route takes us through a mass of stones and boulders. The final part of our climb takes us to the summit proper, marked by an Ordnance Survey trig point, an emergency shelter and the ruins of an observatory. If the weather permits, we take a short break on the summit before retracing our steps back to the Visitor Centre below. We aim to be walking at sunrise so we hope to be greeted with a spectacular daybreak on the descent! All timings are approximate and will vary according to sunrise/sunset. We meet on the Green at Wasdale Head at around 11pm for a safety brief and kit check before moving off towards Lingmell Gill, which we follow up to the area of Brown Tongue when the path becomes a series of steps up to Hollow Stones. We pick our way through the rock field before reaching Lingmell Col, from where we head to the summit. On a clear night the lights of the local area can be seen far below – in daylight you can see across the Irish Sea and the Isle of Man. After a short break on the summit we head back down to Wasdale Head via the ascent route, arriving back on the Green in the morning’s first light for a hot drink before heading off for some well deserved rest. After meeting at Pen y Pass in the beautiful Llanberis Pass we’ll have a quick safety brief and make sure everyone has the correct kit and working headtorch before setting off up the Pyg Track. The initial ascent is fairly steep before reaching Bwlch y Moch (translates as “Pig’s Pass”) from where, on a clear moonlit night, the waters of Llyn Llydaw shine in the darkness. From here the path climbs more gently up to a standing stone which marks the intersection of the path with the Miner’s Track, where the path climbs steeply up to Bwlch Glas, marked by another standing stone. Turning left here we head the last 500 metres or so to the summit of Snowdon where we take a short break before heading back down. Initially we follow the Pyg track but when we reach the standing stone again we’ll bear right and pick up the Miner’s Track, following it back to Pen y Pass as the sun rises. We can organise a Night Hike for you on any British mountain if you have a group of at least 8 people. Contact us to discuss your requirements.